The path customers take before making a purchase has become more complex due to social media. Very often, they perform extensive online research that includes reading ratings and reviews, seeking advice on social networks from friends, watching product videos, and looking at competing products. This makes it more difficult for merchants to know the exact effect various marketing efforts have on the purchase process. Customer Journey tool helps merchants see marketing channel influence on purchases. Google has just released a new tool to help merchants understand how different marketing channels affect consumer purchase decisions. Called “Customer Journey to Online Purchase,” it displays an interactive visual rendering of where marketing channels such as email, paid search ads, and social media influence the customer at different points along the path to purchase. Customer journey tool displays data based on industry and location. The tool displays data based on a number of industries — consumer packaged goods, finance, auto, healthcare and retail, among others — and geographic location. To use the tool, simply choose the industry that most closely relates to yours, select the country, and it will align the various channels in order of their influence. Customer purchase path based on retail category selection. Google arranges the channels to fit within one of two categories. 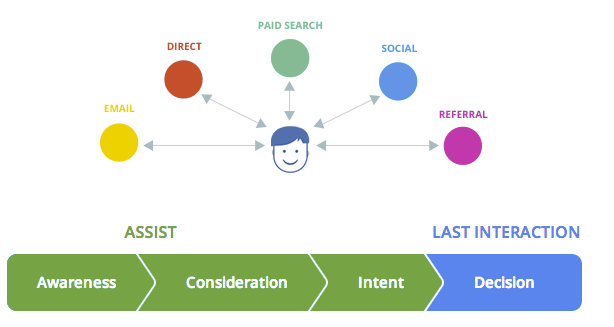 “Assist Interaction” channels build awareness, consideration, and intent earlier in the customer journey. “Last Interaction” channels act as the final point of contact prior to a purchase. Often, merchants base return on investment on the last click that led to the purchase. This can result in an incomplete picture of the effect other marketing channels had on the purchase decision, which is a problem this tool intends to resolve. Interestingly, and somewhat telling, is the role social media plays in the purchase process. In nearly every case, regardless of industry, the Customer Journey tool reveals that social media serves as an assisting channel and is not directly tied to the final purchase decision. Social media’s place, therefore, is geared more toward awareness, consideration, and intent rather than the actual purchase transaction. The source for the data used in the tool comes from 36,000 Google Analytics accounts that have ecommerce tracking enabled. According to Google, the report includes only profiles whose owners have authorized sharing with Google Analytics and third parties. 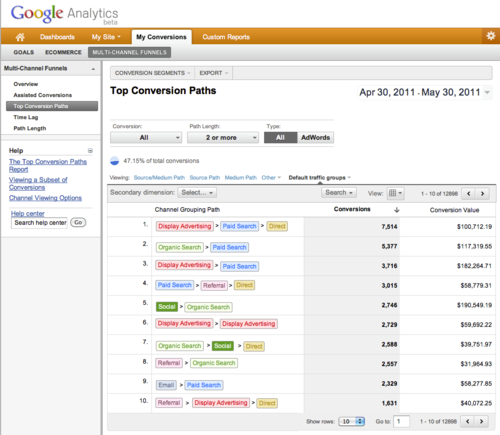 Conversion metrics are derived from the “Multi-Channel Funnels” reports found in Google Analytics. While the Customer Journey tool provides general insights, the specific benefit is found in the Multi-Channel Funnels reports located in the Google Analytics dashboard. 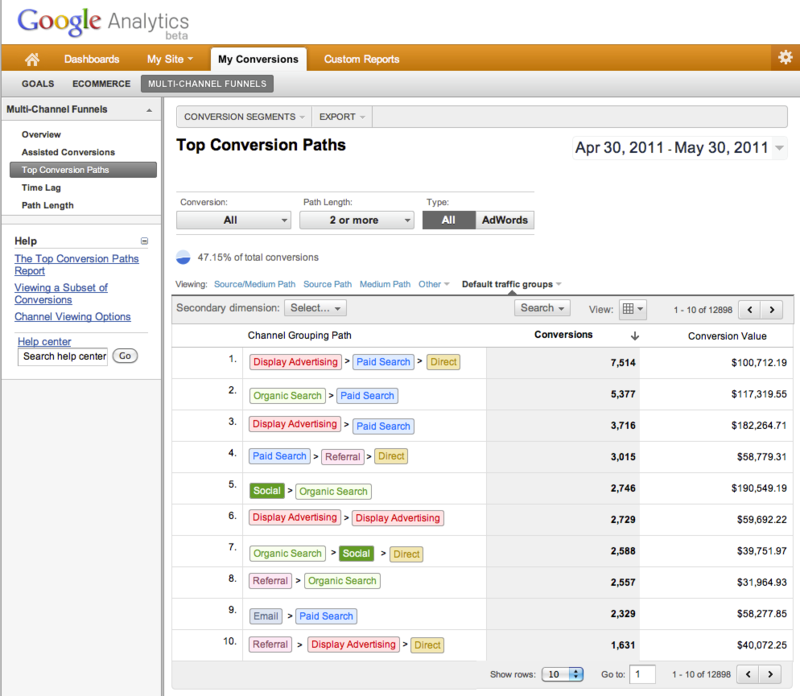 Consumer journey tool data came from Multi-Channel Funnels reports in Google Analytics. “Multi-Channel Funnels…let you look at interactions across different digital media and show how these channels work together to create sales and conversions. More important, this tool helps you make crucial marketing decisions regarding advertising investments at the macro level — what channels — as well as the micro level, for example what keywords and ad placements,” states Google. • Refine marketing tactics according to insights on how various channels work together. Multi-Channel Funnels reports show what channels customers interacted with during the 30 days before conversion or purchase. There are at least five benefits to merchants from using the Multi-Channel Funnels report. All channels. View all of digital marketing channels in one place. Better understand the value of various marketing efforts. Budget. Make the right digital marketing budgeting decisions.